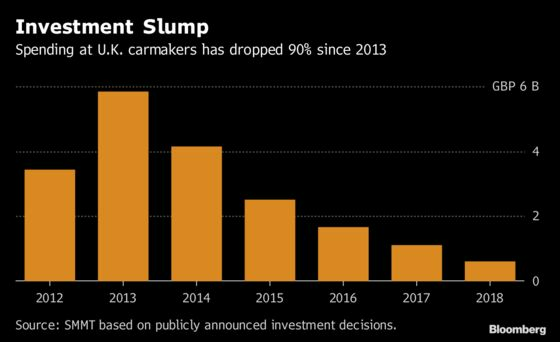 (Bloomberg) -- The British automotive industry saw investment plunge last year as carmakers delayed decisions on upgrading machinery and factories amid mounting concern about the impact of a hard Brexit. Spending plunged 46 percent to 589 million pounds ($769 million), the lowest since the global financial crisis, the Society of Motor Manufacturers said in a statement Thursday. Concern about the impact of a possible no-deal split on supply chains and demand has prompted companies to devote less cash to the U.K. Nissan Motor Co. has delayed wage talks at Britain’s biggest car plant in Sunderland until Brexit terms are clear, while Jaguar Land Rover, the No. 1 U.K. automaker, has cut thousands of jobs and is moving Discovery SUV production to Slovakia as the looming schism adds to pressure from lower diesel sales. 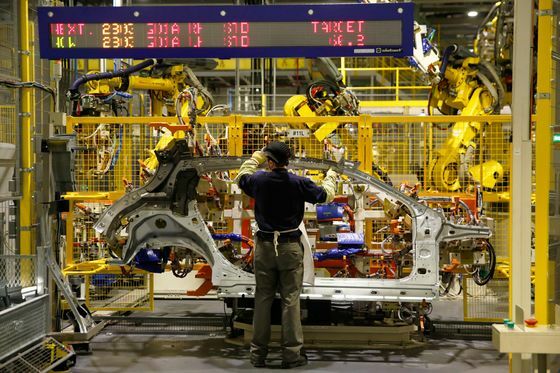 U.K. car output fell 9.1 percent to 1.52 million autos in 2018, a five-year low. The number of those vehicles sold in Britain dropped 16 percent, exacerbated by uncertainty about government policy on taxing diesel models. A continuing slowdown in overall U.K. car sales, which fell 6.8 percent in the year, according to the European Automobile Manufacturers’ Association, is also discouraging investment, said Lloyds Bank head of automotive Stuart Apperley. The slowing Chinese economy took a toll on exports, down 24 percent to the Asian nation and 7.3 percent overall. The U.K. sends eight out of every 10 cars it produces abroad, with the European Union accounting for about half the total.